The Lexus GS received an updated front facia and stronger V8 engine for 2008. A hybrid version and larger V6 were added the year before. For 2009, there are no notable changes. 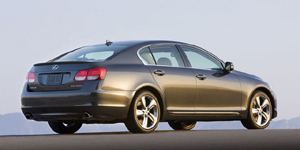 The 2009 Lexus GS Sedan is powered by a base 3.5-liter V6 with 303 hp. Also available is a 4.6-liter V8 with 342 hp. The 2009 Lexus GS Hybrid is powered by a 3.5-liter V6 with 340; hp. Find the used Lexus GS of your choice from a dealer in your area. Search our used car listings now.